I recently had a meeting with a teacher who shared this very clever idea of turning the class token system into a board game. As the children earn tokens, they progress along the path on the board and at different points there are “treasures” which are won when the child lands on them. What a clever idea! Below, I will discuss ways you can adapt it so that you can use it in your class or even at home. The board game is a map or path to treasure. There are many treasure chests along the path and you get the treasure when you reach each chest. As the teacher or parent, you organize the reward schedule so that your child can advance between one and three stones along the path each day. A very good day will give him enough tokens to advance three stones and on a mediocre day he will only have acquired enough tokens to advance one stone. It is only on bad days that he advances no stones at all; but he keeps whatever tokens he did earn on that bad day and adds them to the next day’s tokens. This gives him a bit of a “head start” on the day following a “bad day” and keeps him motivated. Remember that this is all about helping your child stay motivated and rewarding the behaviour that you want him to do more of. This is a simple application of Behavioural Psychology. It was begun by John Watson as early as 1913 and developed further by Clark Hull and Burrhus F Skinner around 1940. Behaviourism has therefore had a long time to be tested and developed into a well-studied and understood approach to shaping behaviour. The most important fundamental of Behaviourism is that behaviour increases in frequency when it is rewarded. Punishment is often used by people as a means to reduce unwanted behaviour. And to a certain extent it does lower frequency; but, as our full jails can show, it is far from efficient in curtailing unwanted behaviour and does not result in good behaviour. As teachers and parents, we want to get our children to behave in good, positive ways. We don’t want to purely get them to avoid bad ways. We therefore need to choose our own management strategy to encourage and increase our child’s good behaviour. Let’s reward good behaviour. And let’s make it fun to be good. Draw up a list of key behaviours you want your child to do each day. · Complete the day’s homework (give this two stars to make it extra rewarding because it takes extra effort). · Pack all the necessary books for the next day into the school bag (show the parent which books he packed) – this needs extra attention and effort from you, the parent; but it is part of training your child in how to be organised and systematic. That is very important for learning and life in general. So it’s worth your time and effort. · Go to be on the first time he is asked. · Staying on task and listening to instructions during the lesson. Now all you have to do is, as you walk around teaching, checking and talking to the children, you put a star in the relevant box for the day, time and if he is on task and his work is neat. Lunch break and recess can either be excluded or stars can be given for polite behaviour and packing away before recess. Let three stars advance him one stone on his board game. You know what things your child enjoys and finds rewarding. You probably give him many of these very often without their being part of a reward system. Now let him earn them as a reward each time he lands on a treasure chest. You will see that the chests have different coloured jewels in them and there is a key under the map to show which colour earns which reward. This is so that you can use the same reward more often and your child knows what he is aiming for. Keep the best reward for the last treasure; this is the crown. As with all games, keep it fun, praise him and be excited with him when he reaches a treasure chest. You could make it even more exciting by covering the colours of the jewels with a sticker; your child is only allowed to remove the sticker and see what colour jewel (and hence which prize) he has reached. Make yours and your child’s lives fun while you help him develop the necessary behaviours to make a success of his life. That’s your greatest treasure! Click here to find out about a program to teach your child to read using fun and games. Understanding how reading evolved (and just how very recently it began) helps understand the difficulties people can have with learning to read. The visual processes of recognizing shapes and patterns and even of recognizing the sequencing "rules" in written words have developed from the start of our evolution. Using our vision to understand our world was crucial to our early survival and has therefore had a long time to become well honed. Recognizing rules and patterns in the environment would provide early warning of predators. Developing that visual perception over millennia allowed us to develop the visual processing to recognize patterns and sequences that letters can have within words and non-words. In a recent study [i] discussed by Marshall in the New Scientist, baboons were taught to be able to recognize 4-letter English words and differentiate non-words from real words. This suggests strongly that the baboons had an innate capacity to learn the rules that determine letter ordering and were applying these rules when faced with unfamiliar words. Marshall explains that this suggests that the visual processing enabling the brain to recognize written words is evolutionarily ancient. Speech is a much more recent development. It is true that many animals communicate by sounds; but only humans have the capacity for speech. Homo-sapiens was the first among our ancestors and the only mammal to evolve the neural controls to allow the very high level of tongue control for non-eating movement. [ii] This allows us a vast repertoire of sounds, which we can use symbolically, giving us the physical ability for speech from which we could develop language. How and when language began evolving is a complex problem still confounding scientists and linguists today. However, David Bickerton[iii] suggests that two distinct evolutionary processes were needed for humans to begin developing language: 1) cultural emergence of symbolic representation 2) neurological adaptations in the brain allowing it to encode syntactic structure. Therefore language is a relatively recent accomplishment in our development as it requires auditory processes which allow us to understand the symbolization of sounds as well as the differences in the sound and word order (“you will come”; “will you come?”). Early man painted pictures on his cave wall representing his life and events. These simple pictures did not have the higher function of representing something more than an event. The drawings were only used symbolically a lot later. What is considered to be the very first writing to have been discovered was on a tablet of solid limestone in the ancient Sumerian city of Kish in Mesopotamia, about 6000 years ago. It was a carving of a foot, a hand and a sledge with other marks beside them which are thought to represent numbers[iv]. Record keeping seems to have been a major motivator for developing easier writing. The scribes began by making simplistic drawings on clay to keep records for their stores and over time they simplified the drawings to become more of a symbol than a direct drawing of the object. Still, the reading process was purely visual as it reflected objects and numbers. Actions, feelings and concepts were not recorded in writing and one did not need to link the visual representation of an object to any spoken word. Linking words to a drawn symbol began with Cuneiform writing in the Near East and Hieroglyphics in Egypt around 3000BC. To give a greater flexibility to writing, the scribes using Cuneiform writing began to develop ways of representing feelings, ideas and actions. They broke spoken words into syllables which could be represented by drawings. An example of this would be: “belief” being represented by the symbol for “bee” and the symbol for “leaf. The Egyptians mostly used their writing for sacred inscriptions on monuments and buildings. They also drew simplified pictures of commonly recognizable objects and animals. 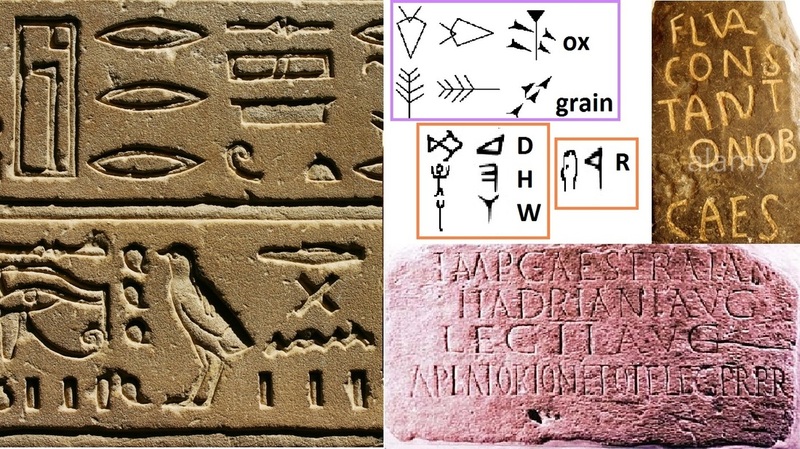 The hieroglyph (meaning: “sacred carving”) was sometimes used to represent the different syllables but began to also represent separate sounds within syllables. This was the start of true reading development, as recent as 5000 years ago! In evolutionary terms, that was just a blink away from now. The difficulty with using pictures or symbols to represent whole words or syllables of words is that it is cumbersome to learn and the reader and writer both need to remember a large number of symbols. There were more about 600 different cuneiform symbols and about 700 hieroglyphs. Thus, the biggest advance in reading and writing was the realization that one can simply use symbols to represent sounds and that even syllables comprise other, more simple sounds. These basic sounds number only 20-30 in any language and therefore the number of symbols needed to represent them is much more manageable. The Canaanites, early Hebrews and Phoenicians around 1600 BC made this realization and the first alphabet was born, with 22 characters, placed in a set order and given names to make learning easier iv. This is similar to how we use letters no represent the basic sounds in syllables and words in our writing today. Writing and reading were finally beginning to link the sounds of spoken words to a drawn symbolic representation. The early Greeks introduced this Phoenician alphabet to Europe in 1000 BC, adding vowels for the first time. Until then, only the consonants had been represented. This increased the demands on our ability to combine visual and auditory sequential processing in order to read and write; but would have made it easier to ensure that the reader interpreted the word correctly. It would have allowed greater flexibility to the writer’s vocabulary, as words would look more distinct from each other. Early reading had to be done aloud. It was very difficult to read silently because there were no spaces between words and no punctuation; the sounds were simply put on the paper as they would have flowed from speech. This meant that in order to work out what was being said, one needed to vocalize. Aristophanes (200BC) is thought to be one of the first to introduce punctuation, using it to help the actors of his plays say their lines correctly. Still, reading silently was very difficult indeed and considered extremely unusual. In 384AD, St Augustine was so amazed at seeing St Ambrose (then Bishop of Milan) reading silently that he noted in his Confessions: “When he read, his eyes scanned the page and his heart sought out the meaning, but his voice was silent and his tongue was still. Anyone could approach him freely and guests were not commonly announced, so that often, when we came to visit him, we found him reading like this in silence, for he never read aloud." Manguel tells us that this is the first definite instance of someone reading silently that has been recorded in Western literature[v]. And this was only 1631 years ago! Silent reading is therefore a very recent development in humans. While it may be true that even baboons can recognise which 4-letter combinations are words and which are not, this is only a part of what reading actually entails. To read, we need to be able to recognise visual cues which are a coded representation for sounds and link those sounds together into combinations that create the sound of spoken words. When we look at the evolution of writing and therefore of rANSFIELDeading, we see that we have not had much time to evolve the neural “highway” connecting the parts of the brain which have to interact when we read. Understanding this helps us to see Dyslexia, not as a disorder in which something is broken or damaged but as a disability resulting from neural pathways which are still developing. We see that we need to understand the development of these processes and pathways to help young dyslexics learn to read. CLICK HERE TO SEE THE REVOLUTIONARY READING PROGRAM. EASY & FUN TO USE. EFFECTIVE BECAUSE IT USES THERAPEUTIC TECHNIQUES. PARENTS, TEACHERS AND THERAPISTS ARE USING IT. [iii] Language Evolution: Christianson M & Kirby S The Hardest Problem in Science? Welcome to 2015! Another year has come to greet us and we can take the opportunity to stop and think about our children’s beginnings. How do we best prepare them for the many years ahead of them? Education is the single most important gift we can give our children after unconditional love and a strong self esteem. But does that mean we should sit them down to formal lessons and begin teaching them mathematics and computer skills as soon as possible? In some Asian countries children as young as three years old have formal iPad lessons and spend up to four hours daily learning English as a foreign language. They are correct in realising that our brains are most ready to learn new information when we are young; the mistake comes when we forget that children’s brains are designed to learn by moving, doing and interacting with their environment. When children spend too much time seated at a desk, they are losing key time for neuromuscular development. That is the development of the pathways between our brain and our muscles. The pathways that allow us to comprehend fully what our eyes see, our ears hear and understand the world we live in. In it through movement and interaction with our world that we develop an understanding of our world and even a true understanding of ourselves as part of this wonderful planet. Getting outside and interacting with our world, gives children a deeper understanding of life, our limitations and our possibilities. Would Newton have contemplated gravity if he had spent his time sitting indoors where no apple was likely to fall on his head? Would the Wright brothers have developed an aeroplane and tried to fly if they had bee seated at a desk all day? Even just being outside watching ants can teach our children about teamwork. New Year, the time for new ideas and new plans. Plan lessons that awaken your child’s whole being. Plan lessons that enlist all the neural pathways in experiencing and learning to understand their world. · Take the children outside and let them write with chalk on tarmac (or with sticks in sand). This not only has a novelty factor which enhances learning; but also increases the sensory feedback from the fingers to the brain, ensuring greater memory for how letters are formed. · Teach mathematics table with clapping, dancing or singing. This enlists the part of the brain that is involved in rhythm and sequencing and therefore increases the child’s ability to remember the repetitive sequence of his tables. · Teach early phonics blend in a hopscotch game. This movement enlists the parts of the brain involved in balance and sequencing of movement and supports learning the sequencing of the letter combinations for phonics. · Make tags of sight words which can be found around the house and garden. Let your child paste them on the objects. Your child will see and feel the object and link it with the word; then the word will remain on the object for future reinforcement. This does mean that your garden will have labels on the tress and your house will have labels on the walls and windows; but that is a small price to pay for teaching your child to read. New Year is the perfect time to look at how we help our children grow up. Let’s not limit their development with too much desk work. Let’s get them up and moving and enlist all their brain pathways when we teach! Click here to have a look at this revolutionary, fun, effective reading program. Designed for helping children with dyslexia. Works perfectly for all children. Poor pencil grip reduces control & tires the child. 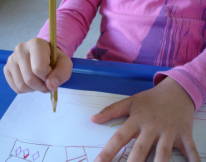 Most people underestimate the effect that poor pencil grip and control have on early learning. Early learning is where the foundations of all our future education are laid; therefore struggling to hold and control a pencil can have long term implications on your child’s education. You probably wonder why and how it has this negative effect. Let’s have a look. In the early years, your child learns about letters and numbers. He needs to be able to write these down as well as read them and manipulate them to make different words, or in the case of numbers, be able to add and subtract and perform calculations with them. I have seen so many children who struggle with pencil grip and control use so much of their energy and thinking on forming the letters or numbers correctly and in the right place, that they have little ‘thinking energy’ left to focus on the spelling, meaning or calculation. You can get a feeling for the difficulty your child is experiencing: write with your non-dominant hand and try to write a meaningful, well-spelt and flowing story about your day; or try to do a long-division or multiplication with 3 digit numbers. What comes easily to you when you have easy control of your pencil and do not have to focus attention on your pencil grip and control or how you form your letters and numbers, is so much more difficult when you swap your pencil into the hand which is unaccustomed and ill-prepared for efficient pencil control. So we see that children with poor pencil grip and control will struggle to perform at their actual level in written tasks. They may know the work but are unable to put it down in good time and are more likely to make “silly” mistakes. Struggling to complete written work when many of their peers manage has two dangerous side-effects. The first is that it can have a very negative effect on your child’s self esteem. He knows that he is trying his best and can see that the others manage better than he does but he does not have the understanding to help him understand why that might be. He is left thinking that the reason is because they are cleverer than he is. This is nearly always wrong and many clever children underperform in written work until they have had help to bring their pencil grip and pencil control up to par. Although it is not correct, it has a negative impact on the self esteem of the child who tries hard and wants to do well. Many children develop behaviours to protect their self esteem. One of the best ways is to avoid these difficult pencil tasks; another is to clown around in the class and earn laughter and praise from peers while giving himself the excuse that he didn’t really try hard and that’s the main reason he didn’t finish the work as well as others did. Both these scenarios have very sad end results. The child who continually tries hard and develops a negative self esteem, carries this with him into adult life, believing he is less capable than others. The child who learns to clown and avoid difficult tasks may save his self esteem by aiming his skills towards peer socialisation, but he learns to avoid difficult tasks rather than trying his best and he also begins to fall behind the rest of the class as they learn more foundations while he clowns and avoids. In the early foundation years children learn to express themselves in writing. They learn to write stories and each Monday the teacher asks them to write about what they did on the weekend. The child with poor pencil grip and control, who struggles to get the letters onto the page neatly and correctly spaced and who becomes tired because he uses whole arm movements instead of efficient finger movements with stable body and relaxed shoulders, will limit himself. He will write as little as he can. This stops him from developing the grammar, spelling and logical sequential reasoning that are developed through learning to express himself in writing. This will have a negative impact on him in later years when he needs to write meaningful paragraph or essay answers to examination questions. To help offset the damage to his early written language development, you can help your child make his own story book, using the computer. His enthusiasm for “publishing his own book” and the easier method of getting the words and letters onto the page will make the task more fun and he is more likely to allow himself longer sentences and more detail in his story. This last point probably leads you to ask why we don’t simply stop teaching writing and teach all children to simply use keyboards. That will help these children overcome many of the early learning difficulties. However, I believe that mankind should think carefully before relegating all our written expression to electronic media. Also, research shows that by writing rather than typing words and information which we want to process and remember, we are more likely to remember it. This should come as no surprise because many people already will scribble a word down to check themselves for spelling. The reason seems very simple and obvious to me and I’m sure that when you think about it you’ll agree: when we write something down we are using our visual memory together with our movement memory (the movement of our fingers and hand as we write). In the rich first world countries, it might be possible for all learning and examinations to be done on computers and key-boards; but it is a very long way away for the less rich countries. If children need to write during examinations, they need to learn to be as competent as possible so that they are not restricted or limited when they need to show their level of understanding of their chosen subjects. If your child has difficulty with pencil grip and pencil control do not ignore it but do not panic either. Early recognition and early support usually has a very good end result. You might want to see some ideas of how you can help your child develop a good pencil grip and be able to easily control his pencil. Click here to read a post which will give you easy ideas. I wrote this article for FOCUS, the newsletter for theOccupational Therapists' Association of South Africa. They enjoyed it and found it useful. Here it is for those of you who are not OTASA members but want to learn how to really help children learn. Occupational therapists need no convincing that play is an important part of child development. We also know that if we want to win a child’s cooperation, play is our best ally. However, we seem to be in a world where children are given less and less space and time to play. Recess time is often used for children to catch-up work they did not complete in class and time after school is spent either on homework or on organised sport, leaving little time for imaginative, unstructured play. Two recent studies, one by the Lego Learning Institute 2002 and another by Fisher-Price Inc. both showed that parents are asking schools to spend more time directly on cognitive tasks, even though 94% of the parents agreed that “time spent playing is time spent learning” [i]. Thus we are seeing children being placed in formal lessons and beginning to formally learn to read and write, when they have not mastered the early foundations that play supports. In my previous article[iv], I discussed how rhyme and rhythm play such an important role in learning to read. It should come as no surprise that it is also important to a child’s ability to develop the sequencing skills needed for number concept and mathematics. When I was in primary school, many recess (break) times were spent with about twenty children jumping over a long rope across one corner of the playground. Rhymes were recited, children had to jump in unison, rules were followed (you had to come in at a set time and go out at a set time). Some adult observers might have felt that we were wasting precious learning time while our teachers were having their tea-break. In fact, we were developing our sequencing skills, improving our auditory processing and learning how to accept rules and to be both good winners and good losers (an important social skill). Last but far from least, we were doing physical exercise that not only helped us to keep fit but stimulated our blood supply in readiness for the next bout of cognitive learning after recess. Meaningful, fairly intense physical exercise has many direct physical benefits to prepare a child for cognitive learning. Strong and Flanagan (as described by R Cook) [v] describe how sport reduces stress through either relaxation or by getting rid of pent-up emotions; promotes the transfer of gasses in the lungs; improves immunity (so we can reduce the number of colds we see in our classrooms!) and that it is a “regulator”. A regulator helps the child to reach his (or her) optimal balance between alert and relaxed so that he is best able to learn. Instead of us sitting quietly, and practicing some cognitive task while our teachers had their well-earned tea breaks, we were out there preparing ourselves to be best ready to learn what they were about to teach us after break. But is it ideal to separate cognitive learning from play? Is play just a way of preparing our minds and brains for the real learning? This has been a matter of much debate over the decades. Before we try to answer that question, we need to look at play and what some cornerstone theories say about it. In 1932, Mildred B. Parten devised a classification for play[vi]. Parten described the stages through which play develops. She described how play develops from individual, solitary play through to social play. She also noted how children initially are spectators, rather than actively involved in playing. If you watch little babies, toddlers and young children, you will see that Parten’s classification is still applicable today. Unoccupied play – the child watches anything that happens or catches his interest. Onlooker Behaviour – at this stage the child is not really playing; but keenly watches others. Solitary, Independent Play – The children play apart, with toys. They may be within speaking distance of each other; but show little interest in making contact. When they do make contact, it is more to take a toy which the other child may have, rather than actual interaction. Parallel Play – the children play near each other but are not involved in each other’s games. Each child is essentially playing his own game; but in close proximity. Associate Play – This is still an egocentric realm of play. The children can share toys; and are beginning to engage with each other. They are not ready for group work but can begin to be encouraged to play in simple group games. Cooperative Play – this is the highest stage in Parten’s classification. The children can share, take turns, play games where one child plays one role while another plays another role in the same game (eg: playing teacher and child). Parten believed that play development and social skills development went hand-in-hand and that assisting children to develop through the stages of play helps them develop the ability to share and participate meaningfully in social interaction and therefore in life. Preoperational – the child learns to mentally represent people, objects and events that are not present. He also begins to learn language at this stage. Concrete-operational – the child can classify objects and events into categories and can manipulate the categories; but is still rooted in the concrete world. This stage appears around school-going age. Formal-operational – This is when hypothetical thinking and planning begin to appear. Reasoning of abstract concepts becomes possible. This stage appears from the beginning of adolescence and carries on through adulthood. Piaget says that we should not try to rush a child from one stage to the next. He believed that each stage subsumes its predecessor and is also still available to us and that, in fact it could be detrimental to a person’s overall development to rush him through any stages. [ix] Thus, an adult who has developed formal-operational cognitive thinking (and therefore abstract and hypothetical thought) is still very much able to think concretely and deal with the simple demands of manipulating concrete objects. Piaget’s theory of how children develop from one stage to the next should still be one of the torches that light our path as we educate our children. He theorised that we are born with basic schema (“basic building block of knowledge”)vii. Examples would be the grasp reflex, the sucking reflex, the way a baby follows movement, especially his mother. It is through interaction with different scenarios in his world that these schema come to be assimilated. When they no longer work well for a new situation, the scheme needs to be adapted or changed to suit the new demands. When we are in the comfortable state in which our schema (the original ones that we were born with plus the new ones that arose by our having to make adaptations) fit the environmental demands and situations, we are in a state of equilibrium. Piaget theorised that learning occurs when we are faced with the disequilibrium of our schema not fitting a new situation and we are motivated to try to restore our equilibrium. Learning therefore happens best when there is interaction with the world; a child may take in information by watching or by listening to his teacher but he really learns when he, himself, manipulates and directly interacts with the subject matter because that is when he will experience the disequilibrium that motivates assimilation and adaptation. Lev Vygotsky also tells us: “What passes unnoticed by the child in real life becomes a rule of behaviour in play.”[x] In his discussion of Sulley’s experiment, where two little sisters chose to play at being sisters, Vygotsky says Sulley points out that when a child is playing at a real life situation (in their example each girl is pretending to be her sister’s sister), she takes conscious notice of things that in real life will pass by without conscious notice. This is something I find very true in learning of early phonics. I have found that children can have reasonable vocabulary and speak with fair grammar, yet have a poor ability to separate out the sounds within words. Separating sounds in words and manipulating them is called elision. In my previous article, I discussed this and pointed out its importance in reading development iv. When the child plays at being an alien or a space-traveller who needs to teach me the way they speak on different planets, he becomes consciously aware of the different sounds. He even takes ownership of letters and their sounds and the rules of the game (how the aliens speak on their planet) can be more easily assimilated. In fact, Vygotsky ascertains that play is the natural space in which language develops because children playing are in constant dialogue, either with themselves or with others. Child Development Media Inc[xi] remind us that if we observe children we will notice that less verbal children often speak more in imaginative play than in other activities. This therefore provides a natural developmental space in which inner speech can be harnessed to support development of other concepts such as number concept and phonics awareness. Vygotski takes tell us that when a child is at play, he is in his Zone of Proximal Development . This is the functional level very slightly above the level of development that he has already achieved and it is the level in which learning most readily occurs. He says: “ As in the focus of a magnifying glass, play contains all developmental tendencies in a condensed form; in play it is as though the child were trying to jump above the level of his normal behaviour.”x Therefore, we as therapists and teachers can observe the level at which the child is best able to learn by watching him at play; then we can utilize that level of play to mediate his development into the next. So to the question: “is play separate from learning and just a way of expending energy or preparing a child for the real job of learning?” it would seem that research and highly esteemed theorists have continued to give us the answer: “No. Play is integral to learning”. Methods of teaching which utilise play will have the best efficacy. When I work with children who have reading difficulties and we play at being spacemen, or shooting out of a cannon at the circus, they are able to draw on their imaginations, reduce the stress they have come to associate with learning to read and begin to see words and letters as something that they can manipulate and play with. One little girl taught her peers at school to play the “Alien” game and had them all practicing their phonics at recess time. Let’s encourage children to play, to use their imaginations, run and skip and recite silly rhymes. When we teach new concepts and skills, let’s try to find ways to incorporate them into the types of games and play that fit the children’s developmental level. That way they will not only take on board what we teach them, they will have their imaginations primed to be able to take the ideas into the future. Click HERE to find out more about this unique, effective, easy to use reading program. Therapists, teachers and parents are having great success using it! [xiii] Fromberg, D.P. (1990). Play issues in early childhood education. In Seedfeldt, C. (Ed. ), Continuing issues in early childhood education, (pp. 223-243). Columbus, OH: Merrill. We cannot learn if we are anxious about making mistakes. If we do not make mistakes, we are not learning anything new; we are already capable of doing it. So, mistakes are not only inevitable but necessary to learning. That’s a relief! Now we and the children we teach can feel relaxed and even pleased about our many mistakes. Once children realize that mistakes are not bad their anxiety is reduced and they become more open to the learning process. A child who is anxious to avoid mistakes inhibits himself and his learning. A child who understands that making mistakes is part of learning can be more open to new challenges. More than just an inevitable part of learning, mistakes provide a powerful teaching tool. Teachers can use the mistakes the children make to teach the real learning skills of analysing and problem-solving. In order to find and correct a mistake, a child has to really think about what he is doing and what he wants to do; he cannot have a half-hearted approach to simply copying a correction or accepting that he “got it wrong”. He gets a sense of achievement when he has corrected the mistake himself (even with a little help and direction from his teacher). This helps him develop his confidence in facing new challenges for learning. When he has worked out where he went wrong and corrected it himself and feels proud and that feeling of pride increases his awareness, enhancing his memory for the correction. Here are just a few ideas. You can use them to get a better understanding of how to use your children’s mistakes in different arenas and the power of using their mistakes as a teaching tool. Spelling: Let the children correct their own work. They can use a red pen and use the teacher’s template to find the correct spelling. They write the correction in red next to the error and again below. Then they swap books and mark each others to check if all mistakes had been found, writing the correction in a different colour once next to the error on their friend’s book. Instead of simply getting a mark for how many were correct the first time, the children get a token if they found and corrected all their mistakes and their classmate found no extra mistakes. If the classmate finds an uncorrected spelling error, the first child must write that word out four times. After this has been done, divide the class into teams and each team gets to ask the other the spelling words (every child must get to spell an equal proportion of the words). The winning team is the one who got the most correct first time asked, added to any tokens children in each team earned for finding and correcting all their mistakes (children who made no mistakes also get a token for that). Teaching spelling this way uses visual memory and figure-ground perception (looking for and checking each word). It also uses muscle-memory (writing the corrections builds muscle memory in the hand and finger muscles). Marking their own work with a red pen reduces the negativity often associated with the teacher’s red crosses on work. Having team challenge directly afterwards, builds auditory memory for spelling and the competitive element increases enthusiasm and helps focus attention (this is particularly important with ADHD children). Maths: Watch the child try to do his sums after you have taught him the method. If you see him about to make a mistake wait, watch, let him make it and wait a little longer to see if he recognises it. If he does see his mistake, praise him for finding it and watch to see how he solves it. If he cannot manage on his own, show him how to go back to the beginning and check each step. If he then manages, praise him for not only getting it right but also learning how to find and correct his mistakes. When he has to find and correct his own mistake, he not only reinforces the correct method but also develops his analytical skills and improves his ability to be organised in his work. If he struggles to see what he did wrong because he has not quite understood, you will know that you have to go back and re-teach him. I find that it is important to take some of the responsibility for this onto myself and away from the child. I will say “we didn’t get that quite right; I need to find another way for me to help you to know how to do it”. This shows the child that we are partners in the learning business and it reduces his stress when unable to remember what was taught. This technique should also be used for visual analytical games (like ‘Draughts’ and ‘Battleships’). Behaviour: Children often get into trouble because they do something silly, rather than because they were intentionally naughty. If we realise that their behaviour was effectively a mistake, we can use the behaviour as a learning opportunity instead of simply getting angry or frustrated. Point out the repercussions of the behaviour. For example, if he ran and tripped and broke your favourite vase; point out that it cannot be fixed and that it happened as an accident that would not have occurred if he had not run. Make him clean the mess and ask him how he thinks he can make up for his mistake. This makes it impossible for him to pass blame away or project anger onto you for getting cross when “it was just a mistake”. It makes it clear that he is responsible for his actions. This helps him take develop a sense of responsibility that we want all members of society to have. If you simply yell at him that you have told him a thousand times not to run in the house he can deflect his sense of culpability by becoming aggrieved at your angry response. Instead of him realising that it was his behaviour and his mistake that caused the broken vase, the lesson can be lost in a shouting match with him stomping off feeling misunderstood and angry. The next time he runs in the house it will be easier to remind him if how the previous time he broke the vase. You will have changed your role from nagging parent, to guiding and directing parent. Everyone in life makes mistakes. We need to teach our children not to be fearful of making mistakes because that will seriously limit their learning and prevent them reaching their real potential in life. We also need to teach our children to accept responsibility for their mistakes and to find ways of correcting them. That helps to build thinking skills such as organisation, planning and attention. It also helps our children to grow into adults with strong self esteem and moral fibre; the type of person of whom every parent and teacher can be proud. Sharon has worked with children for decades and has written posts to share her expertise and experience with parents and teachers. CLICK HERE to see some of her other informative posts. Take the pain out of learning to read. Sharon has developed a unique and effective reading program which uses occupational therapy techniques. CLICK HERE to find out more about it.